There’s a social stigma attached to being fat, a cultural prejudice that is utterly unfair. It makes no distinction between those who are lax about their diet and those whose metabolisms incline them toward obesity even when they eat moderately. But Mother Nature is more equitable. She distributes the gift of longevity not according to weight, but according to how much you eat, taking body type into account. And herein lies a resolution to a long-standing paradox of epidemiology. Notice that at the left end, the mice are eating less than a third of what they would like to eat if left to their own devices, but there is no sign of the curve flattening. In fact, experiments have shown the rate of aging continues to be slowed by caloric restriction right up to the threshold of starvation. But in humans, there seems to be an “ideal weight” where the risk of mortality is minimum. BMI (for Body Mass Index) is a standard measure of weight relative to height. It’s certainly true that people with high BMI are at increased risk of cancer and heart disease, and their life expectancies are shortened. You might expect that people with the lowest BMI had the lowest mortality. But this is not so. Below BMI of 25, there appears to be no benefit from lower weight. For BMI below about 21, the mortality actually starts to climb, and is distinctly higher for BMI less than 18. BMI of 25 is not especially thin. It corresponds to a man (say 5 foot 10) who weighs 174, or a woman (say 5 foot 4) who weighs 145. (Values are similar in these two recent studies (2010) and (2009)). There are some studies that suggest even higher values. For women over 70, there’s a study that found the minimum mortality at BMI=32, and for men over 70 it was BMI=29. (1997) Corresponding weights are 223 for men and 179 for women. What’s going on? Are people so different from other animals, then? Humans are genetically diverse. For any given person, his or her weight is determined by a combination of genetics and life style, including diet and exercise habits. A person may be slender because she has iron discipline, works out regularly and keeps to a low calorie diet; or she may one of those people who can eat whatever she wants and never get fat. Looking at the two people side-by-side, you might not be able to tell which was which; but their metabolic stats would probably tell their tales. Insulin sensitivity is likely to be better in the second person, and markers of inflammation probably higher in the first. David Harrison compared normal mice to mice that carried two copies of a gene for obesity (ob/ob). He put groups of mice of each genetic type on various caloric regimes. The ob/ob mice that were on restricted diets still looked fat, and in fact they had 50% body fat. Normal mice on a similar diet had only 13% body fat. But the two groups showed comparable life extension – both about 50% ahead of normal. In fact, the ob/ob mice were less vulnerable to starvation, so they could survive with less than the normal mice. 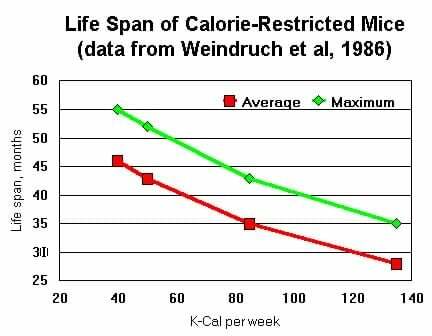 The group that lived longest was ob/ob mice on severe calorie restriction, but they looked like normal mice that were fully fed. This suggests that fat can have a very different metabolic significance, depending on genetics and body type. Here’s what I think is going on in people. The reason that you don’t see consistently longer life expectancies with lower and lower BMI is that BMI is mostly determined by genes, not life style. Some people look to be quite overweight, but are healthy nonetheless. People with low values of BMI are probably that way because of their genes, not their habits. “Skinny genes” don’t improve your health or longevity statistics. Only eating less can do that. What is more, our prejudice against fat tends to magnify this apparent paradox. In our culture, people (especially women) are highly motivated to control their diets when their genes tend to make them overweight. Those whose genes are “more forgiving”, are likely to be lax in their habits – they figure that weight isn’t a problem form them, so they’re less likely to cut calories or to work out. A lot of those people with BMI of 25 or more are genetically programmed to be heavier than they are, but they’re working hard to keep their weight down. The reason that the health benefit of being skinny doesn’t show up in the statistics is that the higher up the BMI scale you look, the more likely you are to find people who watch their calories. The reason that the “optimal” BMI for people over 70 appears to be so high is that people who weigh 223 pounds don’t make it to age 70 unless they have good genes. The ones who survive to qualify for the study are a filtered sample. The reason that the “optimal” BMI is higher for women than men is that social pressure to diet is greater for women. The moral of this story is that we shouldn’t be lulled into laxity by the fact that there doesn’t appear to be a longevity benefit for lowering BMI past 25. For any given individual, it’s probably true that the less you eat the longer you live. But this fact is masked in the demographic statistics for two reasons. First that genetics is more important than life style in determining BMI; and second, there is an inverse correlation between food intake and genetic propensity to be stout (as encouraged by our culture). Everyone can benefit from keeping weight down. But the difference seems to be greater for people who are genetically stout. People who are cursed with an “efficient” metabolism that stores fat get the most benefit from diet and exercise. Taking everyone into the study includes the very sick who are prone to weight loss. Anyone who goes into the hospital usually loses weight, and those critically ill are very cachectic. Thus (this is my conjecture) the large upswing in the data. If such low-weight was a metabolic problem then I suspect the upswing would be less steep. I like you reasoning about the fact of good genes and overweight folks. Never thought about it like that. Yes, good point. Certainly such studies should categorize people according to long-term BMI and this would be a way to eliminate the distortion from people who become emaciated just before death. The upswing in mortality for the lower BMI might also have to do with anorexia also. Eating less may help you live longer. Eating less than needed to stay alive can kill you. Yes, and also people tend to waste away when they have cancer and are very thin by the time they die. So the mortality rate at very low BMI looks high, if you’re not careful how you do the statistics. This is a reasonable and well researched article. A good resource is the Health at Every Size movement – http://www.haes.org . I’m not affiliated with them, but their philosophy helps me get comfortable with myself whenever the messages about body image start to get a little overwhelming. Sorry do not really buy the main message here that “genetics is more important than life style in determining BMI; and second, there is an inverse correlation between food intake and genetic propensity to be stout (as encouraged by our culture)”. The upswing on low BMI is caused by various unhealthy phenotypes including “end of life cachexia”, but also eating disorders. Low BMI due to extreme malnutrition or starvation may lead to hypoleptinemic immunosuppression and susceptibility to life threatening infections. Therefore the unhealthy low BMI genotype of partial lipodystrophy (difficulty in putting on weight due to inefficient fat storage) is just one part of the story. The magic lean genotype that burns unlimited numbers of calories has yet to be found ! Most of the “genetic” component dissected to date in mice and man actually promotes overeating, so genes regulate BMI largely through hyperphagia as far as we can tell so far. So we agree caloric restriction is the way forward, but the genes will fight that tooth and nail ! In addition, some people can indeed tolerate a higher BMI and will not show insulin resistance/metabolic syndrome until a very high BMI but the genetics of this is distinct to that defining BMI per se. I totally agree that the “slope” of the increased risk at higher BMI maybe a bit shallower than it could be due to increased dieting at high BMI. Unfortunately this slope needs to get a lot shallower. Did anyone mention exercise ? Maybe you’re right. This is a subject ripe for quantitative investigation. The striking thing for me is that the “ideal weight” is so high. I think you can’t use anorexia or cachexia to account for people with BMI in the range 20-25. A very interesting article; when I got down to BMI of 23 after a long struggle, I eased off on my diet, but continue my exercise program. Many thanks for your very excellent blogs. BMI seems to be a poor variable to use since it doesn’t reflect the difference between fat and muscle. What would the curve look like if waist circumference was used? BMI also discriminates against tall people. Compare the profiles of two people with BMI=25, one who is 6 feet tall and the other 5 feet tall, and you’ll see what I mean. I wonder about this also. Does having a lot of muscle mass (which generally means you’ll need to consume more calories to maintain) penalize longevity? In other words, are bodybuilders (who often have very little body fat) eating and lifting their way to a shorter lifespan? Or does this penalty only apply for those with more fat?